Injabulo is a Zulu word for happiness and our mission is to ensure that every purchase from Injabulo will help towards lives being changed for the better. The artists who produce our products earn a wage far above the minimum in Africa. Many of them live in rural areas where there is very little work. A decent wage means that they can buy good nourishing food, pay for education for their children but most importantly hold their heads high and live with dignity. You never know where life will take you and when Chrissie Sherwood went to South Africa in 1997 little did she know that this would be the stepping stone to running her own successful company in the UK, that helps make the lives of people in South Africa so much better. 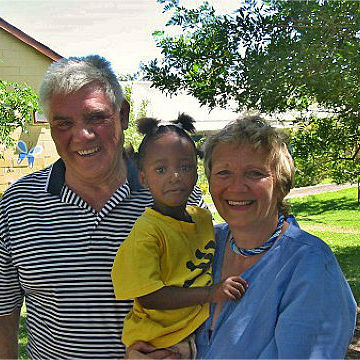 Whilst in Africa Chrissie and her husband Roger met wonderful, kind people who were living in abject poverty but would do anything for you – and always with a huge smile! Seeing people carrying big pieces of cardboard and pallets to make their house and the toll that AIDS and HIV were taking made them decide to help and eighteen months after returning to the UK Injabulo was founded. Our name was chosen as Injabulo is a Zulu word for happiness. Injabulo now works with established empowerment projects and small businesses through South Africa and Ghana. It has always been important to Chrissie that she could see fairtrade policies in action and that whoever the producers are they should all be treated very fairly and be given a chance to improve their lifestyle by learning or developing a skill. This in turn means that they are given the opportunity to enrich and improve their own lives and that of their families. In addition Injabulo works with Pebbles Project, a charity in the Cape Winelands helping children born with special needs as a result of Foetal Alchohol Spectrum Disorder and currently sponsor two children; their sponsorship pays for specialist teacher training and crèche places for the children.